You know that saying “no man is an island” or heard that joke about the Hamptons? Of course you have! Let me tell you about “bridge and tunnel.” Well, mostly bridge as that is the main route into Long Island. Long Island is statistically pretty amazing when you come here and learn about it. There are as many types of bridges to and from here as there are nations of peoples on the island. The Verrazano, Throgs Neck and Whitestone are suspension bridges. These bridges are supported by a strong foundation from a design called a truss. Those triangular shapes help to support the heavy weight of many people that will placed upon it over time. Long Island is the largest island adjoining the contiguous United States, the largest because it is 1,401 square miles and extending approximately 118 miles from the mouth of the Hudson River. Separated from the mainland north by the Long Island Sound and constrained by the Atlantic Ocean, Long Island also happens to be one of the most heavily populated regions in the United States. Our “little” island is a US powerhouse if you look at those facts. Native American tribes inhabited the island for many early years and more recently their populations have been replaced with the descendants of immigrants coming over the bridges from across the world. These immigrants, as with many other beloved NY boros have brought with them their vivacious musical and artistic influences which in turn has made Long Island and its music artists sought after today. As stated by Longisland.com “today Nassau and Suffolk Counties are ranked among the most expensive areas to live in the United States, and are home to some of the nations’ best public and private schools.” Learning music in Long Island has never been easier as the island has access to wonderful experienced teachers, music teachers, art teachers and most importantly, music lessons. Many famous names in music recently and in the past decades have hailed from both Suffolk and Nassau counties in Long Island. They have recorded in Long Island or wrote their most famous hits right here. Whether its rap/hip-hop, punk rock, classic rock, classical, pop, or alternative music there have been many famous songs/compositions written referencing the Island. Many rappers use the reference “Strong Island” when referring to Long Island and pondering on it I too, see it as fitting as this is a place where not only the strong (and successful) come to relax, but also the inhabitants are made stronger here having passion/learning, practice and application as their “trusses.” Many people in music from Long Island are much like the suspension bridges supported by the truss. Out in the world, fortified, mighty, and taught how to take on the weight of whatever may ride on it and to stay strong. “Soul Power” by Wu-Tang Clan, and Long Island-native Flavor Flav of Public Enemy mentions Long Island. If you are an aspiring musician artist it is important to not only spend time and money to hone your craft, but also learn how to market yourself and to sell your music and get yourself heard. You could say these three are also like the triangle shapes that create truss foundation for the bridge. This side of the bridge offers some great venues; lounges, pubs and many live venues to gain your performance experience. The Paramount books a variety of performers. But the first step is the learning and the practice of music. Long Island offers so many places to learn more about music, to work with great teachers and to get lessons to prepare one to perform and to become well rounded musicians. At KBM, we have a deep love of music with all of its glorious sounds and believe it serves as the building blocks to a strong musical foundation and enrichment as taking music lessons has been scientifically linked to strengthen connections between the two hemispheres of the brain, but only if there is practice. With diligent practice in mind, and 25 years of experience we create music lessons & tailor our programs to students’ needs. We teach Piano lessons with the preferred music of the student and basic techniques of piano playing. Our Keyboard lessons offer a wide variety of lessons on musical range. 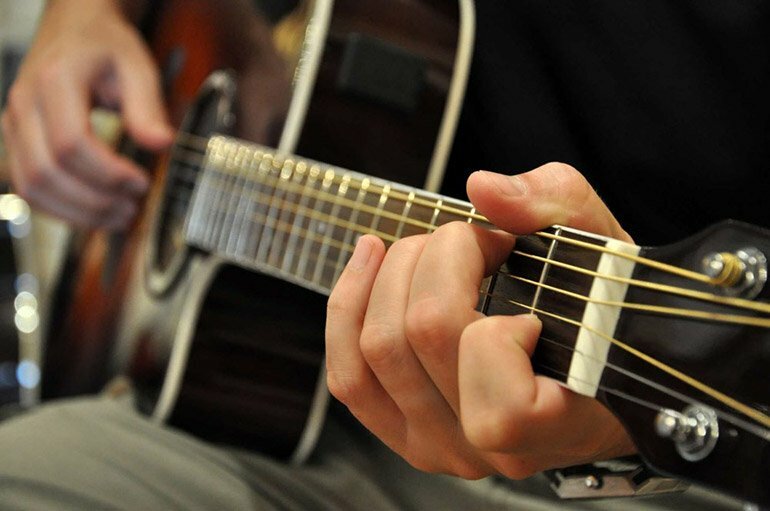 We offer Guitar lessons where a budding musician can receive superior acoustic or electric instruction. We teach our Voice lessons students how to turn a voice into an instrument which requires practice, dedication and professional training. We also teach the Electric Bass, Viola, Flute, and our Violin lessons engage on the use a refined graceful instrument using precision and persistence in directed practice. Personalized instruction assists Cello players in order to excel. Our Saxophone and Clarinet lessons teachers go over teaching proper mouth and finger placement fundamentals and assisting in advancing one’s skillset. Let us help in teaching how to build bridges to your dreams, overcoming hurdles one resilient step at a time, and conquering the mainland from Strong Island. Contact us now (800) 285-5732 to speak to an experienced music teacher today.